Since this is one of the lowest models of the Aspire with no HDD it came with a striped down version of Linux called Linpus and since I am a Windows Guy I needed to find a way to install XP. Â I ended up watching this YouTube VideoÂ http://www.youtube.com/watch?v=2Vt_8p0VllY, this was necessary because the Aspire lacks both a floppy drive and a CD drive. Â After a couple trial runs I had eventually installed XP successfully. Â Windows XP actually needs some tuning in order to run on this machine. The first thing I did was disable the Windows Paging file, then install Google Chrome as the default browser. Â Chrome is based on Apple’s Safari browser and is faster than both Microsoft IE and the aging Firefox browser. Â I also installed Avast for anti-virus and Open Office instead of Microsoft Office. I didn’t do a trimmed down install of XP because I didn’t feel it necesary with the extra 16GB SD card I installed. Since I use this Netbook for remote connection and diagnostic purposes I want to keep it free of the desktop software, and so far this has worked for me. Â Newer versions of the Aspire have adequate hard disk drives and a larger screen that resolve most of the problems. Â I would suggest anyone who has larger fingers to purchase a Dell or HP Netbook which have a larger keyboard and come with XP Home. Â All of these machines provide 2.5-3.0 hours battery life with standard 3 cell batteries and up to 10 hours with a 9 cell. While Apple has been resisting releasing a Netbook for the low end laptop market, word is that one will be out this summer. Â Currently Apple’s Air Book isn’t really considered a Netbook due to its pricing. 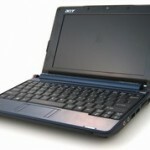 Â You should be able to find a good Netbook deal online, as of this writing for $199-$349. Â Since a lowend laptop can be bought for just shy of $500 I would recommend seeing if you can live with some of the short comings of a Netbook before purchasing one.